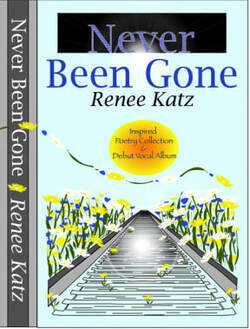 Never Been Gone is the debut combination poetry collection and vocal CD set created by the multi-talented New Yorker, Renee Katz. After enduring a horrific subway crime; and with the spirit and determination bestowed upon her by her Holocaust surviving father, she became an accomplished cabaret singer who sings in well-known city venues, as well as an occupational therapist helping others with physical disabilities. Her compilation speaks of perseverance and the joy that arises from the “gift of perspective” that an accident often brings; which usually comes from a lifetime of experience. It talks about embracing, rather than suppressing, hardship and how that ultimately yields compassion and love - the greatest gift of all. There came a time when I needed to gather up the courage to get back on a New York City subway train. On February 4, 1980, I began my course of study at New York University; and I was determined never to let anything sidetrack me from attaining my goals ever again. On the first day of my early morning commute to NYU, I anxiously climbed the old familiar stairs to the platform. I kept my eyes fixated to the ground, and my back plastered against the wall of the station. As the train barreled in, I took a deep breath, stepped through the door on wobbly legs, and gratefully took a seat. I quickly noticed a homeless man who was singing and collecting money around the car. His snug, worn-out overcoat could not hide his tattered clothes, nor could his happy, up-tempo song disguise his world-weary eyes. I then noticed, to my utter amazement, that he had a hand injury, too. When he got to me, holding out his cup of change, he noticed my injury and stopped singing for a moment. His cup shook just a bit, as his eyes filled with emotion. I offered him a dollar, but he quietly refused and went on his way, singing as I smiled through my own tears. What became very clear in that moment is that our compassion for others is what truly connects us all. We are propelled by our passion and purpose to rise above unforeseen challenges. We are all capable of finding and giving love—the greatest purpose of all. The poetry and music included in this book are set parallel to my life’s path, lined with limitless surprises. My passion and my voice remain strong thanks to the love of my family, friends, and countless New Yorkers who would not let my attacker silence my soul. I have been given a gift of perspective that normally comes from a lifetime of living. I know that pain can lead to a greater joy. I have received and strive to give true compassion. I am grateful for all the lessons I have learned in life, and I now welcome any possibility that arises from landing on an unfamiliar shore. It’s taken years for me to come to this place of gratitude. I know how hard it is to face a challenge, to face uncertainty, to face fear…and what it’s like to suppress those feelings and pretend everything is okay. I understand why it’s so easy to just go through the motions of life. If you allow yourself to feel those feelings, embrace them, and never erase them, you will be amazed at the journey that awaits you. I continue to embrace life joyfully, grateful to add to the layers of perspective, compassion, and love to my soul. The book is a very intense read for a variety of reasons. Katz pays incredible homage to her father, a Holocaust survivor, and her mother, who was a gifted and innate musician. But more than this, the imagery she spins with such poems as "Wildflowers and Daisywishes" (a recurring theme in her poetry), "Chained Intensity," "A Valentine's Hug of Passionless Regret," "Our Moment," "The Pirate and the Gypsy" and "My Baby Boy," don't merely show an other-worldly glimpse into her spectacular life but could well cement her as one of the greatest poetesses of our current-day experience. And those are merely the tip of the haunting iceberg. The CD, which is included with a copy of the book, is something else again. Katz emerges as always a truly stunning soprano, with absolutely brilliant skills of communication and exceptional understanding of lyric. The title number, with music by Carly Simon, makes this worth a listen all unto its own. But she does an equally-sensational job with "I Never Know When to Say When," Stephen Schwartz's "Meadowlark," "Ribbons Down My Back" by Jerry Herman, and the centerpiece, "Everything is Possible," containing a flawless lyric by Christopher Gore. All this, plus the faultless arrangements by Christopher Marlowe, make it absolutely as golden as the lady herself. There's very little else to say about the glory and the splendor that is Renee Katz. She's lived through a miracle, she IS a miracle, and she'll always remain a miracle. Buy the book. Buy the CD. Buy them both. You'll be missing out if you don't, and it would be a downright shame.